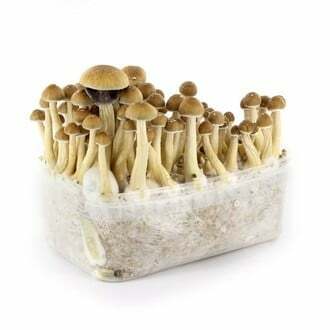 Psilocybe Cubensis Cambodian is the ideal magic mushroom variety for the inexperienced grower - this species is really easy to grow and yields relatively predictable crops. This strain had been discovered near the spectacular Angkor Wat temple complex, but now you are able to grow your own Khmer mushrooms at home. These 100% mycelium kits are filled with 1200ml of 100% mycelium and are ready to grow when they arrive at your doorstep (if you don't want to grow them right away, put them in the fridge at 4°C). Simply follow the steps in the manual and after a few days you will see the first flush coming - try to keep the room temperature around 24-25°C (steady) and you'll be harvesting your first flush after only 9-10 days (or you you don't want to run the furnace all the time, why not use a heat-pad?). Anyhow, these 100% kits produce at least 5 flushes.